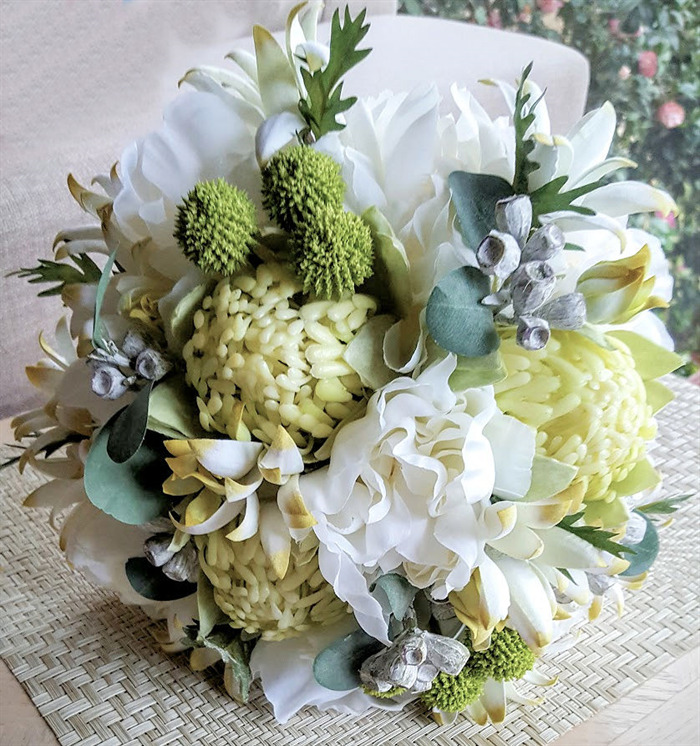 Native Bridal Bouquet with Peonies, Waratahs, Flannel Flowers, Eucalyptus Gum Nuts, Billy Buttons. A gorgeous bouquet for the "Aussie Bride". 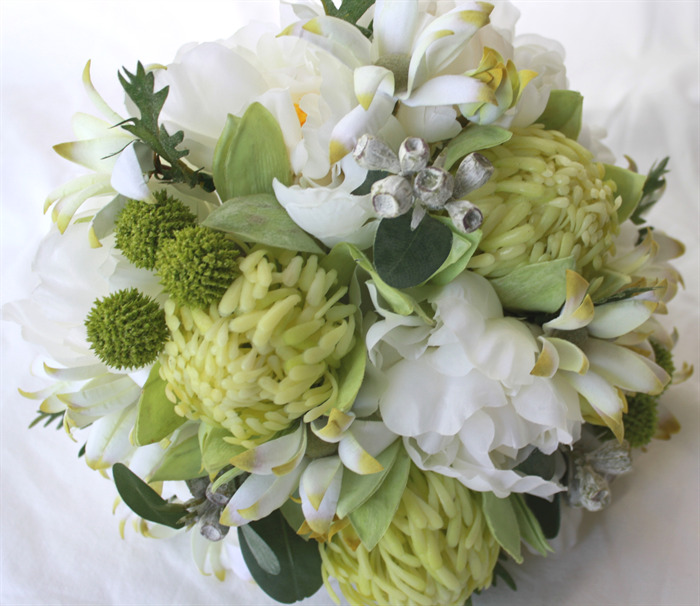 This beautiful bouquet is made with native flowers & peonies and is a dome shaped, natural stem, posy style. The bouquet is edged with peony leaves, tied with white satin ribbon and fastened with pearl pins. 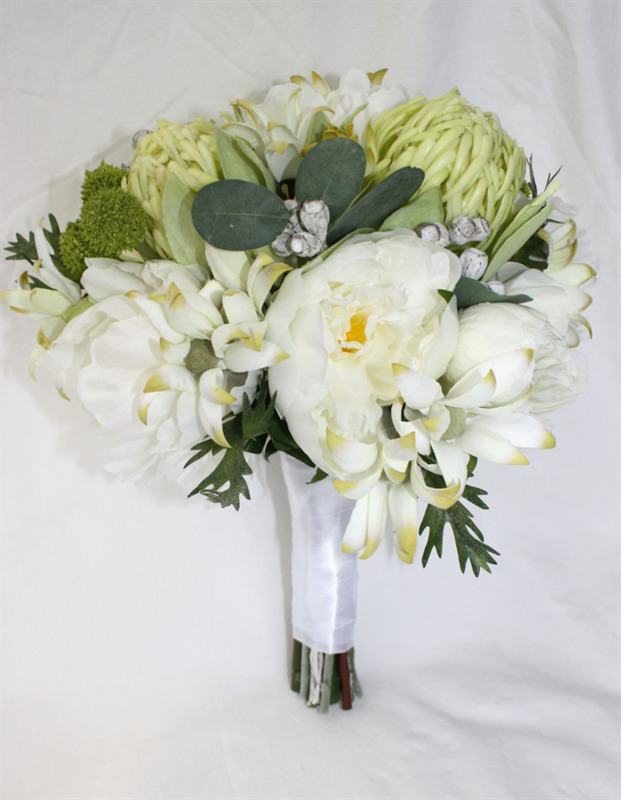 This bouquet is a large size measuring approximately 34 centimetres high & 28 centimetres wide and is ideal for a bride. A groom's buttonhole is also included. Matching Bridesmaid's bouquets are available - please contact us for price & timeframe. Bouquets sold by UnRealWeddingFlowers have been designed & created in Melbourne by a professional wedding florist using artificial flowers . Artificial flowers have stems with wire. We file down the wire on the ends of the stems to ensure that they are not rough. However we cannot guarantee that the stems will not "catch" on fine dress fabrics. If you have any concern about this we are happy to cover the bottom of the stems of the bouquets with ribbon.